The Synthetic Aperture Radar (SAR) is a useful tool to study both marine water dynamics and its pollution, this is relevant near the coastline, where river pollution may be also important. Oil spills and natural slicks are detected with SAR to reveal river and vessel pollution as well as the complex eddy and current interaction in the ocean surface near the coastline. In the framework of the ESA and European Union contracts, more than 1000 SAR images of the North-west Mediterranean Sea area taken between December 1996 and December 2008 are presented using self-similar traces that may be used to parametrize mixing at both limits of the Rossby Deformation Radius scale. Results show the ability to identify different SAR signatures and at the same time provide calibrations for the different local configurations of vortices, spirals, oil spills and tensioactive slicks that eventually allow predicting the behaviour of different tracers and pollutants in the NW Mediterranean Sea. Redondo, J. [et al.]. 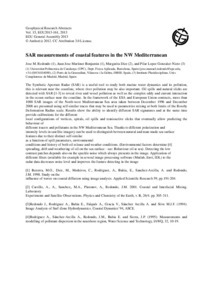 SAR measurements of coastal features in the NW Mediterranean. A: European Geosciences Union General Assembly. "Geophysical research abstracts, vol. 15". Vienna: 2013, p. 161-162.